What Are the Causes of Renal Pelvis Dilation? What Are the Parts of the Human Kidney? 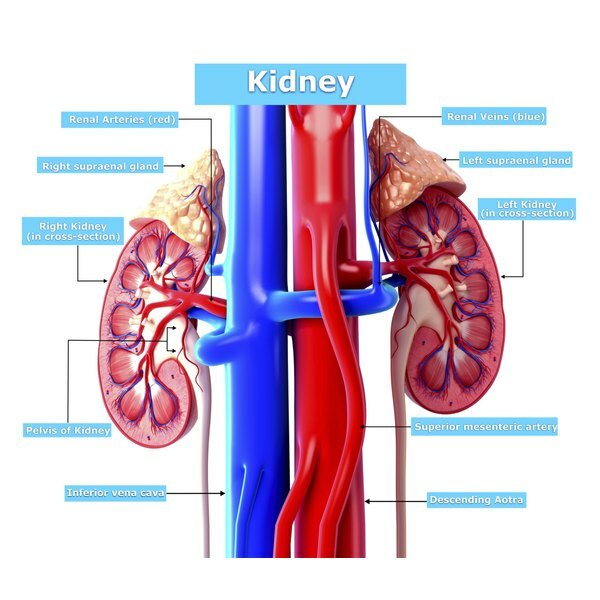 The normal human body includes two kidneys. These dark-red bean-shaped structures reside behind the abdominal cavity between the lower ribs and the low back. The right kidney lies slightly lower than the left. The kidneys work to filter the fluid in the body, removing toxins and waste while returning needed substances to the blood. They maintain the purity of fluids in the body and excrete the waste and excess fluids through the urine. In addition, the kidneys help to control blood pressure, produce a hormone needed for red blood cell formation and help to metabolize vitamin D to its active form. One side of the normal kidney is convex, or bulging outward, while the other is concave, or indented. Each adult kidney weighs approximately 150g, according to the text "Human Anatomy and Physiology," and is surrounded by three layers of supportive and protective tissue. The renal capsule comprises the innermost layer and provides a barrier against infection. The fatty middle layer helps to hold the kidney in place, while the outer layer of dense fibrous tissue anchors both the kidney and its associated adrenal gland. The kidney is divided into three regions: the cortex, the medulla and the pelvis. The renal cortex lies in the outer convex area and has a light colored granular appearance. The darker renal medulla is shaped into pyramids, which drain into the funnel-shaped tube called the renal pelvis on the concave side. The renal pelvis then leads to the ureter, ultimately draining to the bladder. Each medullary pyramid and its surrounding cortex comprises one of the kidneys seven to nine lobes. Each lobe then drains into an area called a calyx and subsequently into the renal pelvis. The area between the pyramids is called the renal column. Because the kidneys work to continuously filter the blood, they are each supplied by a large blood vessel called the renal artery. This artery then branches into smaller vessels and enters each lobe of the kidney, ultimately penetrating all the way to the cortex. After the blood is filtered, it then returns to the heart via the renal veins. Each kidney contains approximately 1 million microscopic blood-processing units called nephrons, according to Urology-textbook.com. Each nephron consists of a glomerulus, blood vessels, a capsule and tubules which all work together to filter the waste from the blood and then return the necessary substances back to the blood. The waste and extra fluid then forms the urine. While the kidneys are the workhorse of excreting waste, they are only part of the urinary system. The remainder of the system is made up of the paired ureters, the bladder and the urethra. The ureters drain the urine to the bladder where the urine is stored. The urethra then carries the urine from the bladder to the outside of the body. "Human Anatomy and Physiology";Marieb, Elaine;1992. Dr. Mary Schwieters is a family practice physician in rural Minnesota. She obtained her undergraduate degree in Biology and Education. She then graduated from the University of Minnesota School of Medicine and completed a three-year residency in Family Medicine. She especially enjoys nutrition, preventative care and women's health. What Should Be the Size of a Child's Kidney? What Are the Functions of Cuboidal Epithelial Cells in the Kidneys?